The Japanese Maritime Self-Defense Force will have a Crossover with Cardfight!! Vanguard! With Cards of the Clan of Aqua Force which will have the Ships of the Navy! The TCG Cardfight!! Vanguard will have a collaborative work with the Japanese Maritime Self-Defense Force. The Cards will appear on the new Expansión that will appear on October 17. 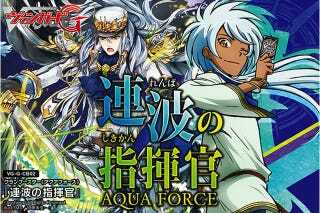 The Cards in question will be of the “Aqua Force” Clan, which appeared quite awhile ago and are used by Jaime Alcaraz on the Cardfight!! Vangaurd G Anime. Which especiality it is based on the number of attacks and stands one can do in a row. The Other Clan that will get a Boost will be of the “Bermuda Triangle” and probably “Grand Blue”. Cardfight!! Vangaurd Girs Crisis, the New Season, will come this October 10. Here it is the new promo.